[Monday Motivation] Are you afraid to fail? 17 Sep, 2018 in art / big why / business / comfort zone / goals / Health / leadership / monday-motivations / perfectionism / relationships / sales by Minette Riordan, Ph.D.
I’ve been seeing a lot of chatter recently in blog posts and articles about “Fail Fast” and “Fail Forward.” When uber successful business leaders are interviewed they often point out their willingness to fail and fail fast as one of the secrets to business success. What does this mean? It’s more about innovation than it is failure. These leaders know that the faster they share information, products and services with their tribe, the faster they get feedback and know if their ideas will work or not. They don’t take it personally. They take it as a learning opportunity to move on, do better, get it right the next time. This is how the improve their productivity and grow their businesses fast. This can be a challenging mindset to adopt. I was listening to a recent podcast with Amy Porterfield interviewing Brooke Castillo and Brooke at one point said, “Discomfort is the currency of your dreams.” This was such a good way to say what I have been feeling and noticing. In the early years of being a business owner, the level of discomfort was really high. There were so many times I felt afraid – they almost always involved standing up and speaking out in front of groups of people. I can remember when I was in grad school having to do presentations at conferences, I would be so nervous and sick to my stomach that I wouldn’t even remember the presentation afterwords. The first time I gave a presentation on marketing to a local organization in Plano, TX over a decade ago I was so nervous my knees were shaking and I gave a 20 minute talk in 10 minutes. Yep! I am sure I sounded like a video recorder on fast forward. Then there was the first time I had to give a 30-second commercial in front of a room of 100 people, without any advance warning or preparation. I wanted to run away or skip my turn. I know my face turned beet red that day but I did it. And I kept going back. A few years later, I was named Small Business Owner of the Year by that organization. Not because I was making the most money or the smartest person in the room but because I kept showing up. I was consistent. I stayed in action. And I contributed to the group. Over the years I kept getting up and speaking, nerves and all. In fact, I have come to realize that I love public speaking, it’s one of my favorite things to do. In spite of the nerves and the flutters in my stomach, I am happy at the front of the room. Sometimes my knees still shake and my face turns red but I keep going. Last week I talked about being the Warrior. In those moments when nerves threaten me, I tap into that Warrior archetype and I take action, in spite of fear, nerves and butterflies. 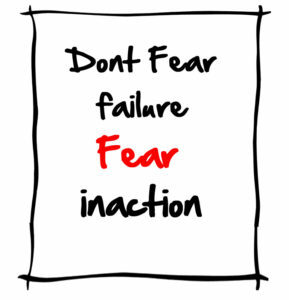 I invite you to ask yourself where in your business are you staying stuck in fear and not taking action? Then ask yourself, am I willing to to feel uncomfortable or afraid in order to grow my business and serve more people? In addition to overcoming my fear of public presentations, I also had to overcome my fear of sales. That was a doozy, I’m telling you! I will share more about that next week. For today, I challenge you to face your fear of failure, feel the discomfort. Have a loving conversation with yourself that goes something like this. You are safe. You can do this. The world needs you. Getting into action is the fastest way I know to move through fear to success, innovation and opportunity. I will see you on the other side… and remember you can always pop into the Productivity for Creative Business Owners Facebook group and share what you are up. It’s so much easier to face your fear with friends at your back. We got you! P.S. If you are struggling with visibility in your marketing, consider joining me and my friend M. Shannon Hernandez at The Confident Expert Retreat in Pennsylvania in October. Picture yourself surrounded by trees in shades of gold, orange, and red. A historic lodge with a wraparound porch welcomes you in before you even get to the door. You hear the gentle trickle of the breeze dancing across the water of a nearby creek. As you breathe in the crisp air, you feel something primal and brilliant ready to awaken within you. You can feel that in this place you will discover who you are even if you don’t see it yet: Brilliant. Creative. Confident. You can find all the details here.